I'd like to share a Mother and Daughter story. Last year, I had the privilege of working with a couple in choosing wedding bands. 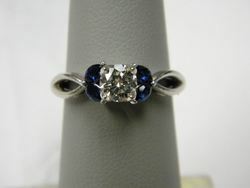 This year, the bride wanted to design a special ring using her first engagement diamond for her teenage daughter, incorporating her birthstone, blue sapphire. 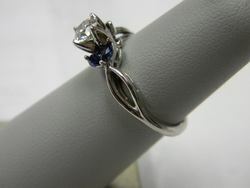 The design is open and with the marquise cut blue sapphires framing the diamond, the focus is on the center diamond. The style is something this young woman will carry with her throughout her life, remembering what a special Mom she has.